Some wool, linen and cotton fibers dyed in the colors of my spring gardens! It was fun to go through the shelves and drawers of wool thread and Dreads to begin another project. Some times creativity begins this way. I spent the morning shopping for shrubs, annuals and a few perennials to add texture and color to the studios well established flower beds. What fun looking and touching and creating a new theme for this year. The already blooming Forget Me Nots, Pink and white Bleeding Hearts, Primrose, Lily of the Valley, Lilacs, Bearded Iris will welcome the new additions. Gardening for me is much like designing a new Hooked project. Color and texture get me really going. So in conjunction with the out of doors, another piece will be on the loom and in progress. 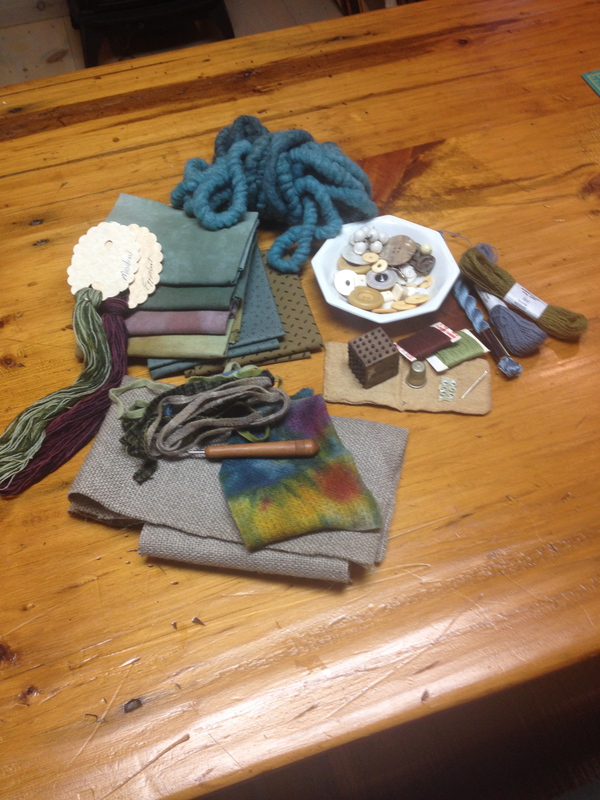 As a member of Artists North , the finished pieces of fiber will be displayed and for sale at the Art Center. Please stop by when in Charlevoix. The address is 17959 Ferry Road. you will enjoy many talented artist in residence here in Norwood’s historic Inwood Corners. Be sure and visit Biers Gallery housed in the red school house down the hill. To top the day off I stopped at a new shop south of Petoskey and filled a few empty spaces in the car,plants, antiques, cloth napkins and a new blouse! Thank you C.J. Another beautiful day spent with friends and laughs from one of my partners in crime! Off to hooking outside with the views of June in Bloom!